An interesting interview with Paul Mather regarding the use of M-Squared Aircraft S-SLA Breese 2 in pilot training. 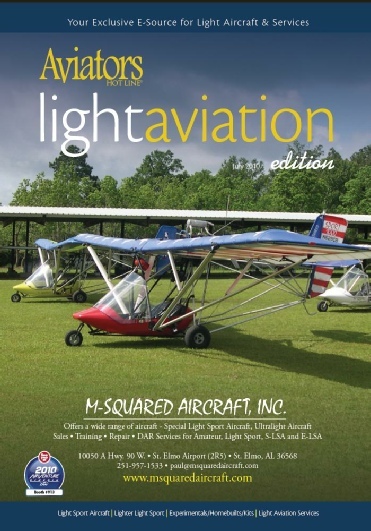 Updated discussion of M-Squared Aircraft Light Sport airplanes. Breese 2 with the HKS 700T Turbo engine. Single place and part 103 (Ultralight) interview. M-Squared Breese X/L Part 103 Ultralight. DAN JOHNSON probably has more airshow aircraft int erview videos posted on the internet than anyone else around. He has always done an excellent job in presenting M-Squared Aircraft accurately for those showing an interest in our airplanes. We would like to thank him for his support of the Light Sport and Ultralight aviation industry. M-Squared on Floats - You can’t beat a Rotax 912 100hp on the water. We have lots of videos of our planes in action plus interviews with our President, Paul Mather. If you want to see more after checking out this page, check out our Facebook site. If you have questions, feel free to give us a call at: (251)957-1533.